A problem with fuel supplies caused travel chaos for passengers flying out of Manchester Airport. In total, 13 flights were affected by the fuel shortages as planes were left grounded, it was revealed. 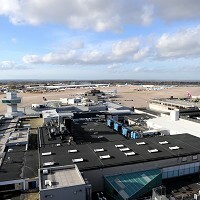 Most of the affected passengers experienced delays of up to half an hour, but one particular flight to Tunisia had to be pushed back more than two hours. The fuel shortages were put down to a production problem with the airport's supplier. It gets its fuel from Essar refinery, near Ellesmere Port. The unexpected delays highlight the importance of air passengers making sure they have travel insurance before they head off on their journeys. A spokesman for Manchester Airport said: "Most of the flights are operating normally. There were no cancellations, no diversions, and most of the airlines have made contingency plans for fuel.